The disciple Thomas wants to go where Jesus will go but doesn’t know how to proceed. He seeks clarification. Jesus gives him a five part answer, which another disciple John records for us. 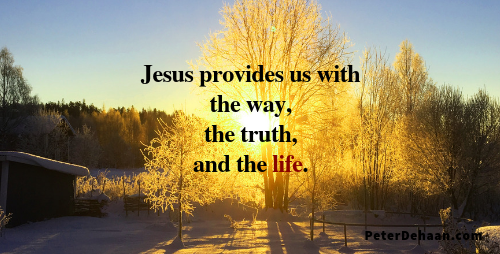 Jesus says, “I am the way and the truth and the life. No one comes to the Father except through me,” (John 14:6, NIV). I Am: In the Old Testament God the Father effectively tells Moses to think of him as “I am.” When Jesus repeats this phrase in his concise answer we are reminded that Jesus also exists as God, in the form of God the Son. The Way: Jesus is the path to God the Father. Jesus points us in the right direction and provides the means for us to get there. The Truth: Jesus personifies truth. He exemplifies truth, proclaims truth, and models truth. We can rely on the words of Jesus as true. The Door to Father God: The first four parts of Jesus’s answer, culminate in his conclusion: it is through him that we are reconciled with God the Father. Jesus provides all that we need for our journey in this life and into the next. What does Jesus mean to you? How do you understand Jesus?